If you have been reading this blog for awhile now you know that I have a slight obsession with containers. 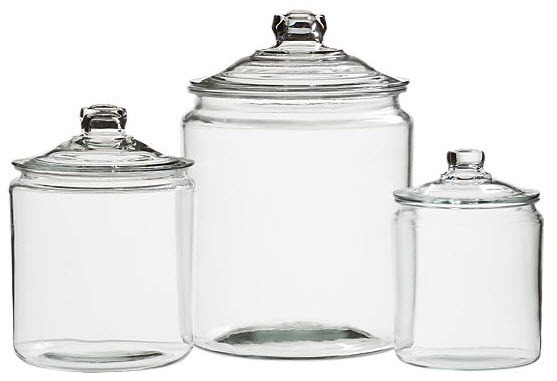 Any kind really, boxes, trays, plastic boxes, and now jars. When I registered I made sure to register for plenty of containers. I mean really, you can never have enough. See the above image for reference. EmersonMade has just about the most amazing pantry I've seen- I'm obsessed. Back to the point... these jars. I have a ton of them at my house right now and I never thought I would find a home for them all, but I did!! 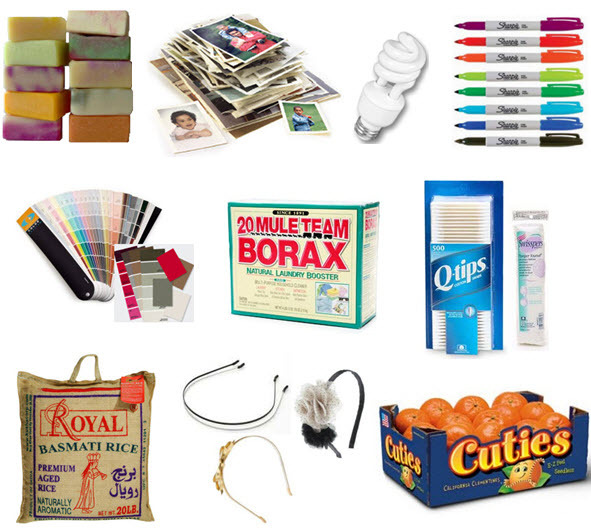 And I really do have all of these things stored in jars. It just makes everything look so pretty and neat and organized. I mean a pile of headbands on my dresser = gross. But a pile of headbands, in a jar on my dresser=cool! Light bulbs scattered all over the storage closet = messy. Light bulbs stored in a jar = OH YES! So, run out and get yourself a stock pile of jars now. I promise you will find a million uses for them too. PS- Anything I'm missing above? What is your favorite thing to put in jars?? That's a very good point.. I always love the pretty pictures with jars filled with various things, but when I'm face-to-face with a jar in a store, I can't think of a thing to put in them. I should just grab them and figure it out at home! I usually leave clothes all around my bedroom - wish I could stuff them all in a jar! I keep my groceries and sundries in jars, just like Emersonmade. The best! I have one I use as my cookie jar and in the summer I use it for lemon-ade. I do love jars for collections! I love this! An idea that has been around yet you help to make perfect sense of it!! OH! my goodness! Light bulbs in a jar is brilliant. I will get my stock pile as directed! Thanks for the fab tip! My entire house is in serious need of some jars!!! FYI-- Wal-Mart sells a very similar jar for next to nothing in a variety of sizes, including reeeeealy big. Just in case you are cash-poor and jar-hungry:) I have been filling jars (antique blue canning jars) with leftover corks-- so pretty! Emerson's pantry is in my inspiration folder! I love these jars and have wanted some for ages (I will have to check out Melissa's WalMart tip! ), but I read somewhere that they're not good for food because they don't have a seal. Have you found that to be the case? Right now I'm collecting the Oxo pop containers for my pantry items. I should start buying some regardless for all the non-perishable items that would be great to collect in jars! mason jars are probably my favorite! i also have a jar problem. but, headbands in jars?! i love it! I keep my nail polishes in a big jar in my bathroom. Love those crate and barrel ones with the tops -- I mayyy be investing in some more of those. I keep our flour in a jar. It's less messy and oh so pretty! I also have 2 larger baby food jars in my desk drawer for paper clips and rubber bands. Laura- I dont keep food products in them really, because they arent air tight. Actually, I take that back, I have rice in one, but we use alot of rice in our house and that one jar is kept in the pantry, so I dont worry about it as much. Melissa- I will have to check out Walmart ASAP, thanks for the heads up! I have a serious problem with containers too. Hence I can't go to the Container Store without spending way too much $$. That place is heaven! So smart of you to register for containers. I wish I'd done that. Surprisingly some of my favorite containers can be found at IKEA. I used them in my pantry makeover and they are great quality and dirt cheap. 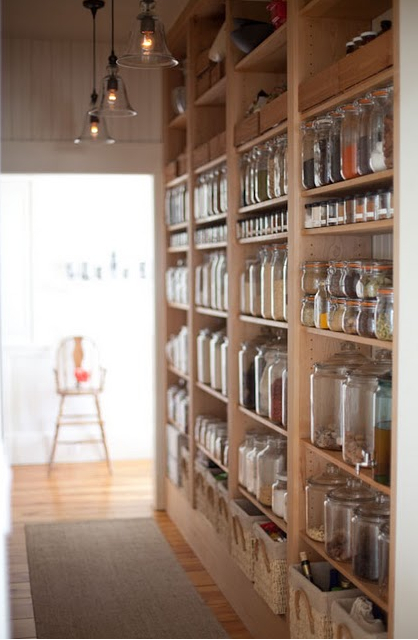 I love that pantry too and all of the jars. You have motivated me to get some. I wish you would show a picture of yours with your "stuff" in them! wow- love it. and love that person that organizes like that! How fun! I think I'm going to have to start storing my headbands in jars now...! I'm a new follower, coming over from The Pursuit of Style -- lovely blog! So glad to stumble upon your blog! I have 4 or 5 of the 2 gallon size containers in my kitchen and fill them up with all sorts of stuff... very helpful, and cute. My jars look exactly the same as the link from crate and barrel, but I got them for half the price at WalMart - $9.98. Cant beat that! I can sooo relate! I keep pretty much everything you mentioned in them...I have them in the kitchen, bath and m office to hold measuring tapes, window hardware, craft supplies, etc. LOVE. THEM. Target sells these also FYI. I need to hear/see about your wedding day!